Next time you're down with cold and cough, consider fighting it with the help of this yummy tropical fruit- pineapple. According to studies, pineapple, along with other ingredients, has proved to be effective in providing relief to people suffering from TB (Tuberculosis) as well as those suffering from cough issues like hacking. In one particular study, it was found that a blend of raw pineapple juice, honey, cayenne pepper, and salt, helped to dissolve the mucus in the lungs of TB patients. In another study, researchers found that the raw pineapple extracts helped to decrease the mucus five times sooner than the over the counter cough syrups, and helped patients recover 4.8 times faster. Overall, pineapple was found to offer relief from coughing and hacking in particular. Why is pineapple an efficient natural cough syrup? 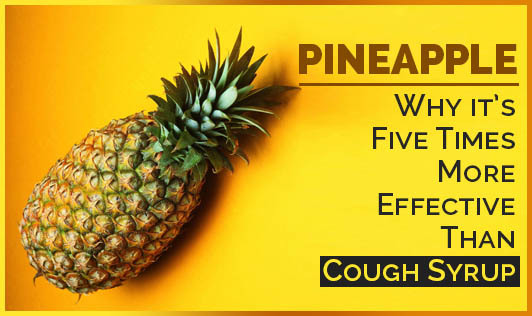 Pineapple successfully helps to keep cough at bay for 2 reasons. 1. The fruit contains the enzyme bromelain, responsible for fighting inflammation and aiding digestion. It also contains a great deal of the mineral manganese, which helps in the formation of connective tissue, improves nerve function, diminishes mucus build-up in the lungs, and thus help you fight cough. 2. The fruit is an excellent source of Vitamin C which helps to remove free radicals from the body and in turn allows the airways to function more effectively. Vitamin C is also known to improve immunity and help in preventing recurrent cold, flu, and ear infections. In addition to acting as a natural cough syrup, pineapple is also found to provide relief from arthritis, combat various cancers, and manage blood pressure.